As machine learning begins to play a greater role in the delivery of personalized customer experiences in commerce and content, one of the most powerful opportunities is the development of systems that offer marketers actionable insights that they can take advantage of to maximize every dollar spent on marketing programs. But the rise of AI in business for marketer actionable insights creates a challenge: how can marketers know and trust the reasoning behind why an AI system is making recommendations for action? Because AI makes decisions using incredibly complex processes, its decisions are often opaque to the end-user. The machine learning black box challenge is not new and has been the key topic of discussions for many AI projects for one main reason – the need for transparency, trust and a good understanding of expected business outcomes. Why did the machine come up with this recommendation? What is are the underlying root causes and driving factors? It’s difficult and potentially dangerous not to have answers to these questions, not be able to connect the dots, and not know the expected future outcome if you are making important business decision. It’s hard to trust a machine’s recommendations that you don’t thoroughly understand. This is where the need for Explainable AI (XAI) comes in. It’s becoming increasingly important in AI to be able to explain why it has reached a particular recommendation or decision. Explainable AI provides the next stage of human-machine collaboration. It doesn’t come to replace human workers; rather, it will complement and support people, so they can make better, faster, more accurate decisions. 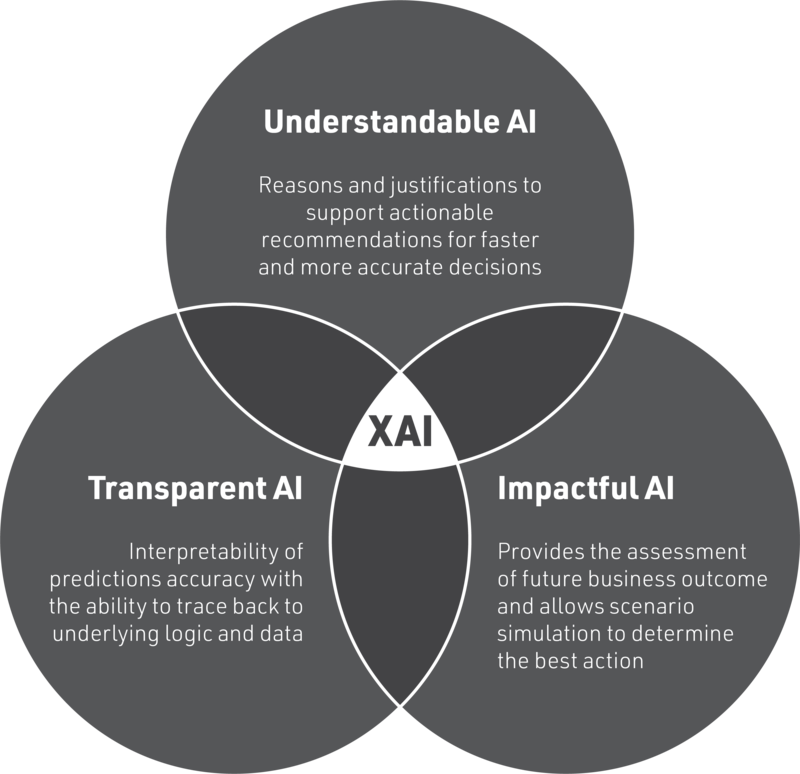 XAI brings transparency to the forefront of business decision making, unlocking the power of artificial intelligence and machine learning and thus delivering actionable insights that unlock the true business value. When receiving recommendations, advice, or even descriptive characteristics, looking for reasons and justifications behind the recommended action should be compulsory. It is not enough to simply predict the outcomes or suggest the next best action without showing the connection to the data and the impacting factors used to reach it. The use cases for e-Commerce and digital marketing where Explainable AI will provide explainability, transparency and thus will improve business results. XAI will provide reasons, explanations, model accuracy and the expected outcome for specific messaging, offers and user experience to engage with the target audience in the most optimal way. XAI will increase offer relevance and will boost user interest and engagement. XAI will provide key factors that drive predicted conversion. It will allow adjustment of the key factors by a business user in real-time to further optimize profitability and business outcomes. This reasoning and transparency will lead to a decrease in abandoned shopping carts and an increase in average order value, resulting in higher revenue and conversion rates. The transition to Explainable AI is underway and must be part of any customer experience initiative. It will empower the line of business to take actions based on the explanations that machines give them. Moreover, XAI will put data into context where a business user needs to take an action as part of the business workflow. The convergence of AI, supporting data and actions will shorten the time and effort between actionable insight and decision-making. It will encourage more people to incorporate XAI and supporting data into everyday decision making.